This year’s premier classic off-road event, the Classic Dirt Bike Show sponsored by Hagon Shocks, drew a record number of visitors to Telford International Centre on February 18/19. 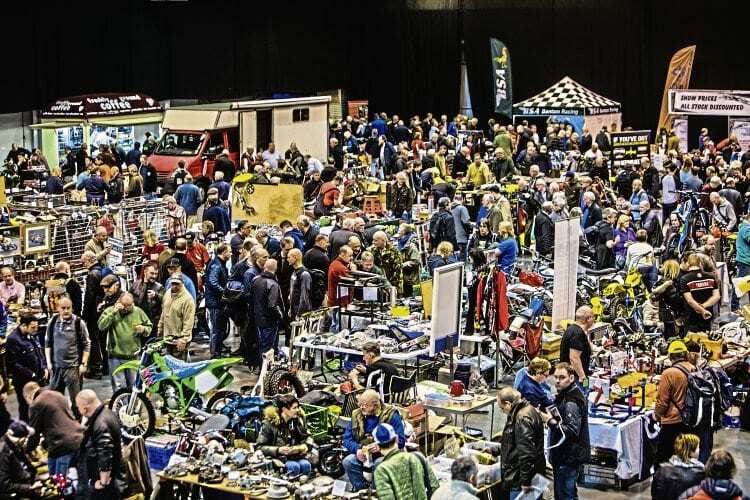 Visitors to this year’s Classic Dirt Bike Show swarm around the many trade and bike jumble stands offering everything the off-road enthusiast or bike restorer could wish for. With numbers 13% up year on year, a highlight of the event was the first-ever full line-up of Greeves motorcycles – one for every year the company existed – on the Greeves Club stand. The machines ranged from 21 scramblers from the first production run back in 1954 to the very last QUB Mk.2 380cc Griffon in 1976, and the display was so well received that the club was awarded best club stand. The Telford show has always been a place where enthusiasts get the chance to rub shoulders with famous faces from the past and present off-road world, and this year was no exception. The two guests of honour – 1983 British 125 champion and current Honda MXGP boss Roger Harvey and motorcycle commentator and off-road fanatic Jack Burnicle – regaled the crowds at both the show and traditional Saturday dinner with tales from their careers. Additional notable appearances throughout the weekend included Sammy Miller, Arthur Browning, Yrjo Vesterinen and Sid Lampkin. A vast range of trade stands, both indoor and outdoor, offered parts, services, accessories, advice and much more, with most visitors walking away with their pockets a little lighter, laden with off-road goodies for their latest projects.